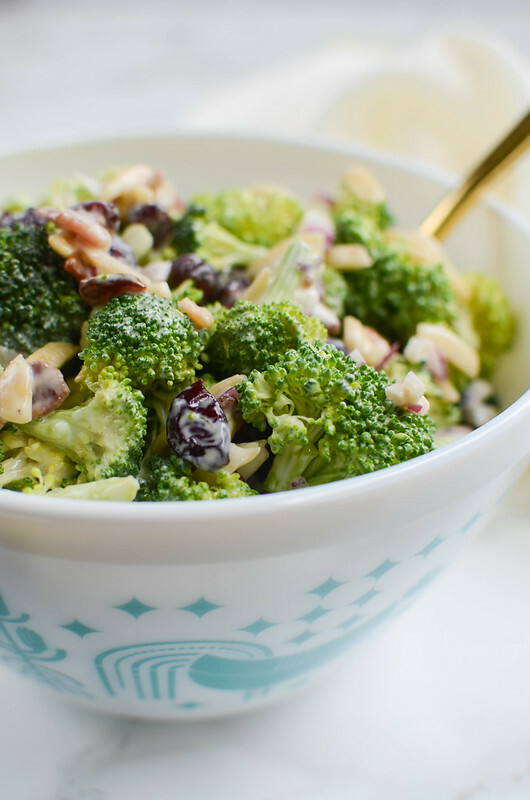 Cranberry Almond Broccoli Salad – a lightened up version of the classic! 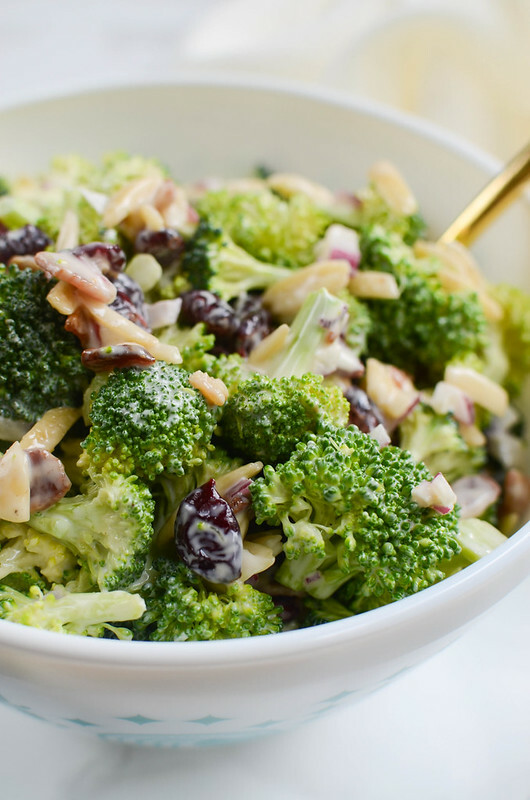 Broccoli, crumbled bacon, almonds, red onion, and dried cranberries in a creamy, tangy dressing. Perfect side dish for a summer party or a holiday dinner! Heeeey guys, happy Monday! Fresh week! I feel like we all need a fresh start, huh? Can you believe that Thanksgiving is NEXT WEEK?! I cannot. How did this happen? I haven’t planned a thing! I have a turkey in my freezer though so I know that’s happening, at least. And I’ll make the dressing that my family always makes because that’s my favorite. And I’m sure there will be pie. There’s always pie. Another thing I also always make is broccoli salad. But first, that bowl! Did you notice how cute the bowl I used is?! 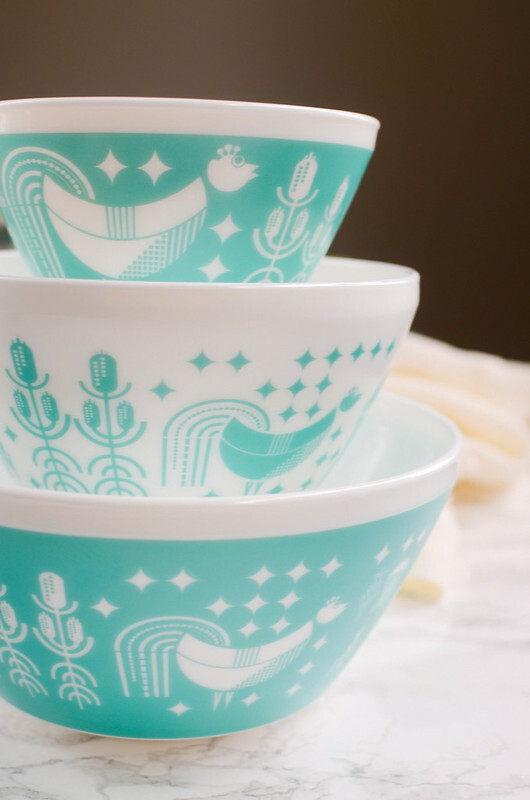 I am absolutely IN LOVE with these Vintage Charm™ Inspired by Pyrex® bowls. If you know me at all, you know the highlight of every season for me is changing over my Pyrex wall. I’ve been collecting vintage Pyrex for years now and Vintage Charm takes those classic designs that I love and puts a modern twist on them. 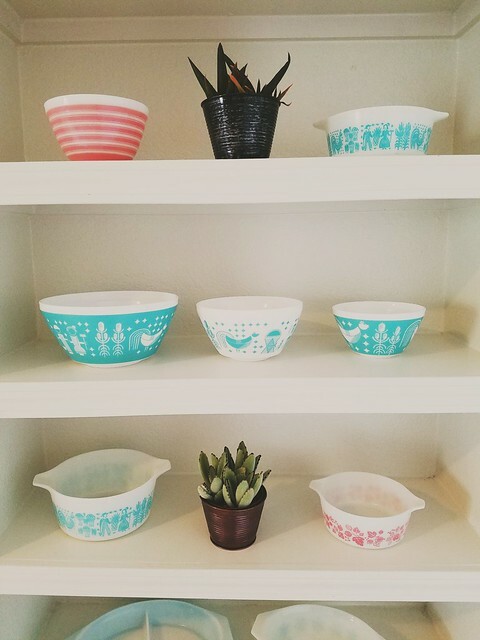 As soon as I got my hands on this gorgeous set – called Rise ‘N Shine – I changed my Pyrex wall over to bright colors so they would fit right in. The vintage blue ones in the photo are the ones that inspired Rise ‘N Shine and I think they are so cute displayed together. Vintage Charm is the perfect gift for anyone in your life who likes pretty things, which is everyone, right? These 3 bowl sets are beautiful displayed and also super functional in the kitchen. You can buy Vintage Charm online and in-store at Target, Macy’s, Walmart.com, Amazon and also at ShopWorldKitchen.com. If you order from ShopWorldKitchen.com, use code VINTAGE20 for 20% off through December 3, 2016. This code is good only on Vintage Charm products. 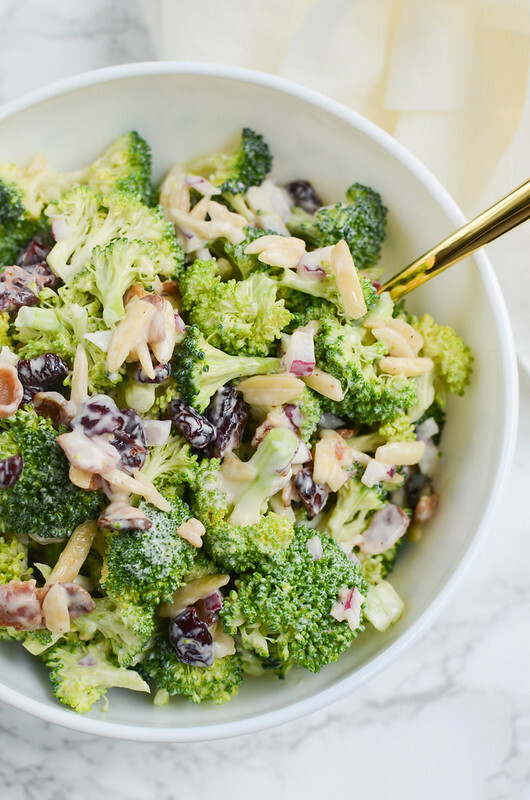 For this fun twist on the classic broccoli salad, I did a mixture of mayo and Greek yogurt to lighten it up. And then it’s also tossed with diced red onion, crumbled bacon, slivered almonds, and dried cranberries. This is one of those recipes that gets better as it sits in the fridge so prep it a few hours ahead to make your life a little easier. I usually wait to add the almonds until I’m ready to serve it, though, so they stay nice and crunchy. Bacon and Cheddar Mashed Potatoes – creamy mashed potatoes with sour cream, cheddar cheese, bacon, and green onions! Corn Casserole – one of my favorite holiday side dishes. The secret ingredient is cornbread mix! Carrot Apple Salad – thinly sliced carrots and apples with raisins in a creamy sweet and tangy dressing. This one is a surprising kid favorite! In a large bowl, whisk together mayonnaise, Greek yogurt, apple cider vinegar, sugar, salt and pepper until smooth. Add remaining ingredients and toss to make sure everything is coated. Cover and refrigerate at least 1 hour before serving. 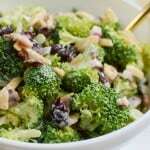 7 Responses to "Cranberry Almond Broccoli Salad"
Why is the contest closed already if this was just posted today? It’s all about the dressing (stuffing)!! Love the Pyrex bowls! It’s not Thanksgiving without Pumpkin Pie! I love the Golden Days design! It is pretty and matches my kitchen. Definitely the mashed potatoes and turkey gravy.